The blurb: On the lush Mediterranean island of Porquerolles off the French coast, award-winning landscape designer Ellie Brooke has accepted a commission to restore an abandoned garden. 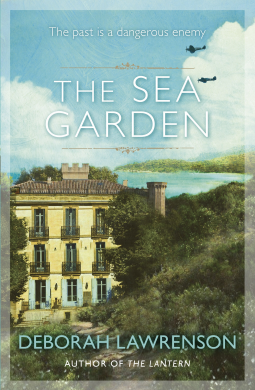 The fine house and surrounding estate overlook the glittering sea but the longer Ellie spends there, the more she senses darkness. The owner’s very elderly mother, Madame de Fayols, takes pleasure in unsettling and undermining her. Her stories of the Domaine’s past reveal a lingering evil that seems to haunt the garden. It gradually becomes clear that Madame de Fayols has a very personal reason for wanting to destroy Ellie’s peace of mind. It involves revenge, madness and a search that Ellie’s grandmother Iris refused to give up. My review: I’m in two minds about this book. It feels like three individual strands that haven’t been interwoven as seamlessly as they could be. It jars and as a reader it left me baffled – not something you look for in a good book. Let’s look at the three parts separately. Marthe’s story which is utterly charming. I wanted to read more, I wanted to smell more! The characters entirely came to life, the suspense of the French occupation, the entrapment in her own body for poor blind Marthe who has an extra dimension of confusion to her every day. A state that her pseudo-family understand more as they are plunged into dark and confusing times. I could have read an entire book on Marthe and the distillery. Iris’s story is similarly wonderful until… I’ll come to that in a mo. Iris works for the secret service in London and here you see what’s happening on the other side of the channel where the home fires are burning. It’s a wonderful World War II depiction of the struggles of a few brave men and women and how they trade in lies to stay alive. But Iris story has to wrap back into Ellie’s – the landscape gardener. The part I found so lacklustre and devoid of depth and warmth. I suspect this was made even more apparent to me by the contrast with the other two stories. Personally I don’t think the book works as a generational family story but that doesn’t mean that some parts of it aren’t really wonderful to read. Mixed emotions at the end of this one, so it’s getting a six.